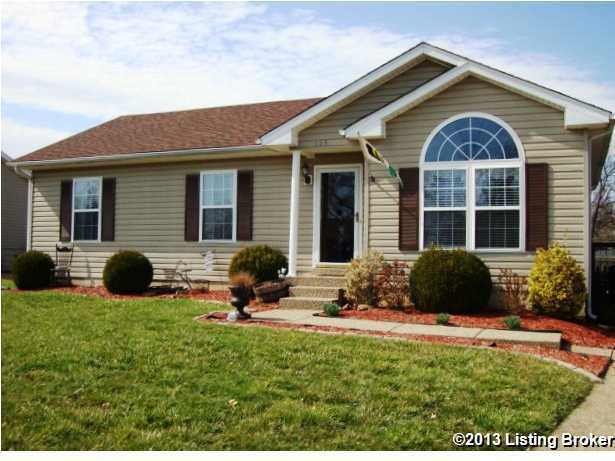 Beautiful 3 Bedroom 2 Full Bath Home! Great floor plan! Elegant interior! Owners have lovingly cared for their home and it shows the minute you walk through the front door. This is a home that feels good. Make an appointment to come experience it for yourself. Vaulted Living room with palladium window. Large Master Bedroom with a private Master Bath and walk in closet. Wonderful Deck leads to a huge, park-like, rear yard that is completely fenced and perfect for your outdoor entertaining. There is also a yard barn to store your outdoor tools (playhouse shall not remain). A new roof installed (2010) and Seller is providing a 13 month HWA home warranty for Buyer peace of mind. Don't wait ... call today! Direction: Bardstown Rd. to Landis Ln. right on Meadows Dr. right on Benjamin Pl. Bayfield is a subdivision within the city of Mt Washington, Kentucky. There are currently 0 Homes for Sale within Bayfield, with asking prices ranging from $0 to $0. The average list price per square foot of the available inventory in Bayfield is $0, which is the Mt Washington average of $220. Recent comparable homes have been selling for 98.47% of their asking price. Waterfront homes represent of the available Bayfield inventory. The total number of households in the zip code of Bayfield is 7,255, with an average household size for of 2.66 people. The total number of renter households within the zip code of 40047 is 1,268, which means that 82.52% of households in this zipcode are owner occupant households. 155 Benjamin Pl, Mt Washington KY 40047 is a Home, with 3 bedrooms which is recently sold, it has 1,184 sqft, 0 sized lot, and Driveway parking. A comparable Other, has bedrooms and 0 baths, it was built in and is located at and for sale by its owner at $ 0. This home is located in the city of , in zip code , this County Other, it is in the Subdivision, and STONE MEADOWS are nearby neighborhoods.